During late summer and fall, just about everywhere you go you'll see pumpkins. These Central American natives are great for crafts, decorations and food. A member of the squash family, pumpkin is high in beta-carotene, potassium and vitamin C; low in fat; and high in fiber. Smaller, three- to six-pounders are the best for pies since they're sweet and non-stringy. As with all squash, the flowers are edible too! If you can find named pumpkins at your local farmer's market, look for these tasty baking types: 'Small Sugar', 'Sugar Pie', 'Baby Bear' and 'New England Pie' (sometimes called 'Small Sugar') — the pie pumpkin of all pie pumpkins. The early colonists were the first to make pies from pumpkins. Originally they used the flesh as an ingredient in pie crusts. The pumpkin pie, as we know it today, evolved from slicing the top off a seeded pumpkin, adding spices, milk and honey and baking it in hot ashes. The colonists were also responsible for the word pumpkin, which they changed from the French word pumpion, derived from the Greek word pepon for "large melon." Pumpkins love warm weather. These large squashes require 85 to 115 frost-free growing days, depending on their size. The Chicago area's last frost is approximately May 15 and then frost isn't expected again until October 15, theoretically providing almost 150 frost-free days, although we're lucky if we get 120. 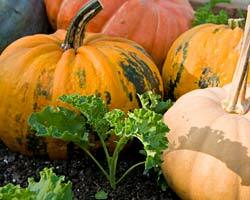 Pumpkins prefer well-drained, fertile soil in full sun. Sow seeds directly into the garden around mid-June (four weeks after the last frost) to give the soil enough time to warm up to 60 to 70 degrees. Spring is unpredictable in Chicago, and the seasons often go from winter directly into summer. Sow three to five seeds per hill, 1-1/2 inches deep, spacing the hills 6 feet apart. A hill is a 1- to 2-inch mound that is 1 to 2 feet wide. When the seedlings have produced their first true leaves, thin the plants out, saving just the two healthiest ones. Sidedress with compost after the first blossoms appear. Pumpkins are almost 90 percent water and have high water requirements. Water each hill with at least two to three gallons of water per week. Water the roots only to keep fungal problems at bay. Pumpkins have been known to increase their size by almost one-third following a heavy rainstorm. Insects can be a problem. The squash vine borer lays its eggs in the vines. As the developing larvae feed on the interior of the vines, the vines collapse, cutting off all nutrients and water from reaching the pumpkins. Striped cucumber beetles are the vectors of bacterial wilt, which will kill a plant. If these problems have occurred in past years, consult Plant Information for the current approved presticides. Pumpkin varieties recently grown at the Chicago Botanic Garden's Fruit and Vegetable Garden include 'Rouge Vif d'Etampes', a decorative French heirloom that has flat, glossy red-orange fruit. Its size can vary from 15 to 40 pounds and it matures in 95 days. Atlee Burpee Seed Company first offered this pumpkin in 1883, but today the seed is available through Seed Savers Exchange at (563) 382-5990. 'Halloween in Paris' is a yellow pumpkin, inside and out, developed in France, weighing 15 to 20 pounds. The appearance is striking with a somewhat flattened, oval shape, smooth skin and sweet flesh, which makes it recommended for pies. This French variety will need 100 days to mature. The seed is available through Park Seed at (800) 845-3369. There were two pumpkin winners for 2002 from All America Selections, which are available through most seed catalogs: 'Orange Smoothie' has fruit weighing five to eight pounds, with compact vines reaching no more than 6 feet. This pumpkin matures in 90 days and is great for carving or painting and it has sweet meat for pies. 'Sorcerer' is full-size, weighing 15 to 22 pounds, but is produced on a compact vine reaching only 10 feet. It matures in 100 days and can be used for crafts or pies.